Google AdSense Bringing Back Ad Navigation Arrows? Home > Google News > Google AdSense > Google AdSense Testing Scrollable Ads With Arrows Again? Google AdSense Testing Scrollable Ads With Arrows Again? Back in 2007 Google started experimenting with the ability for users to scroll through AdSense ads by clicking on little arrows embedded in the ads. 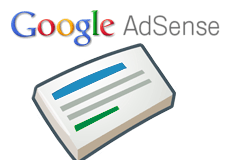 Then in mid-2008 Google officially launched the navigational AdSense ads. This feature went away quietly some time ago and hasn't been seen in a while. We have seen arrows for buttons to click through the ad to the ad landing page. But not for scrolling to another ad. A WebmasterWorld thread has one publisher claiming Google is testing the arrow based scrollable AdSense ads again. Anyone else seen this today? The big box arrow -> and underneath nav arrows < > to scroll for more ads. Think they will bring these back?